You can get a magnificent effect by making ash totally black – also known as ebonizing. 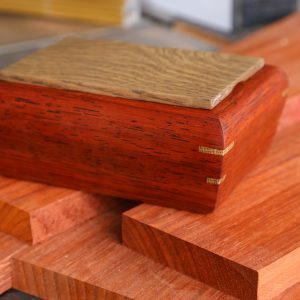 That’s because the wood has a large open grain, much like red oak, and you can make that texture show through while ebonizing the wood. The result is an astonishing juxtaposition of a 100% black color with the nice visual warmth of beautiful wood grain texture. Admittedly, it’s not for everybody. 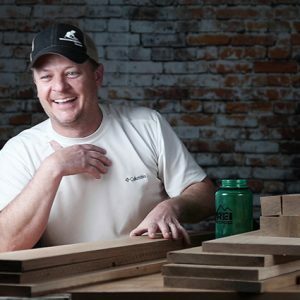 Some woodworkers despise the idea of coloring wood in any way. But others don’t. Frankly, I think it’s a perfectly legitimate technique in the art of working with wood. So how do you do ebonize ash? 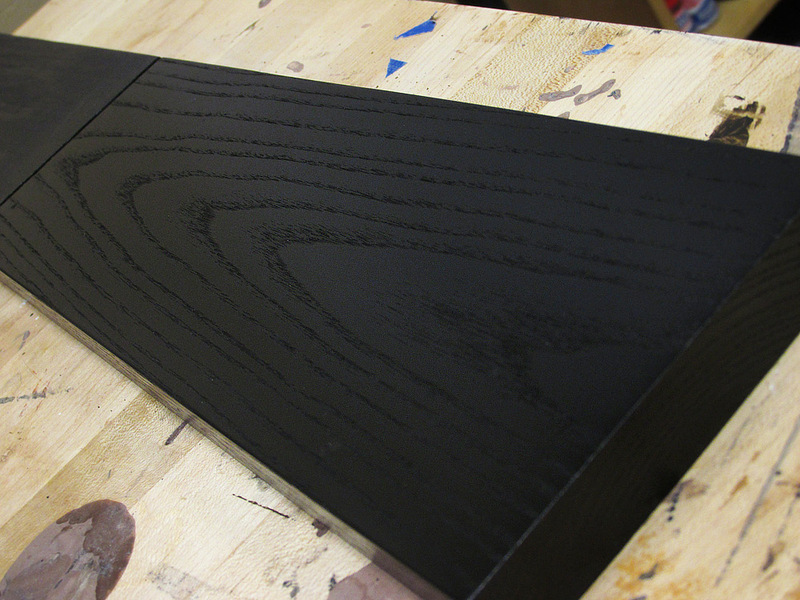 You have a few ways to do it, but this demonstration is by using a jet black wood dye. It’s straightforward, easy to do, inexpensive, and very fast. 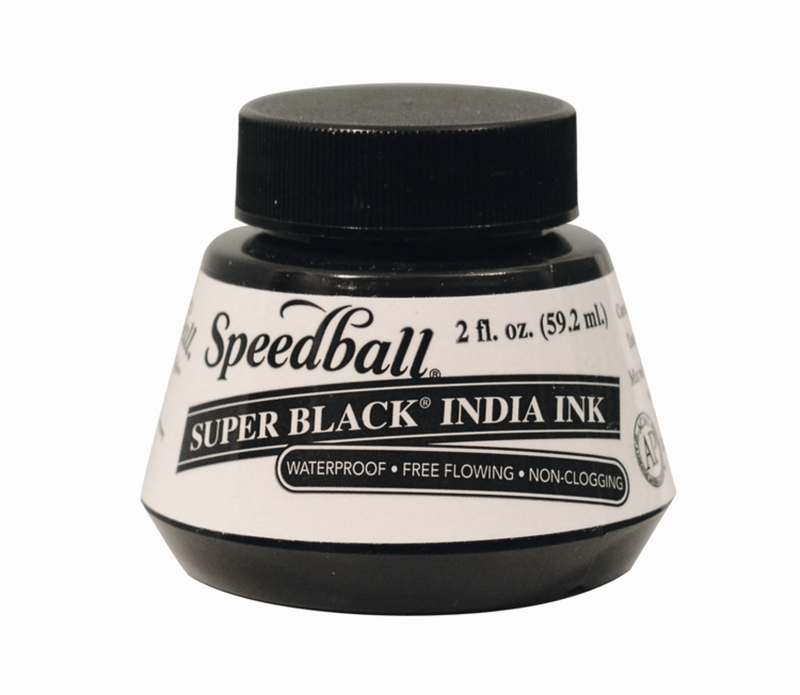 Black India ink is a good choice because it comes out perfectly black with about 3 coats. If you were to do what everybody does when they want to learn about something — that is go to Google and pluck out a search — you’ll find some legends and fables about using various home-brew remedies like a solution of vinegar and steel wool. A home chemistry experiment might be fun, but sadly, it’s an exercise that won’t work well on ash. 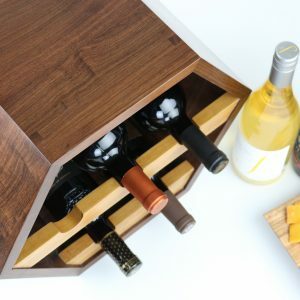 The iron ions that result from the reaction of mixing the steel with the acid (vinegar) will react with tannic acid found in some woods, such as oak, and that reaction makes the wood turn black. But there is no tannic acid in ash. So it won’t do the job on ash. Waterproof India ink, however, will work and it’s a good option. You get a solid black color in about 3 coats. 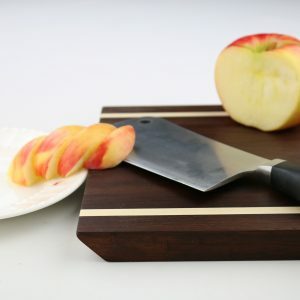 The only problem is it’s waterbased so it will raise the grain and therefore requires some extra care in order to get a good smooth wood finish. Using a jet black dye, in this case Jet Black dye from Solar-Lux, is another fine choice and it’s the product I’ve chosen to use in the demonstration video above. Unlike dyes that you mix yourself, Solar-Lux is a premixed alcohol based dye. The trouble with mixing your own black dye for ebonizing wood is that it often comes out too gray, or sometimes blueish. The Solar-Lux Jet Black dye turns out to be a good answer to these troubles. It doesn’t raise grain and it’s solid black. Like all dye on open grained woods, there does remain one small problem. After you apply the dye and take a close look at your piece, you’ll see that the dye just doesn’t reach down deep into the pores. You’ll see little specs of wood peeking through, but they’ll be deep in the pores. That’s due to the surface tension of the liquid, it doesn’t matter what color. But it’s most obvious when putting black on such a pale wood like ash — white specs will stand out amid a black dyed board. 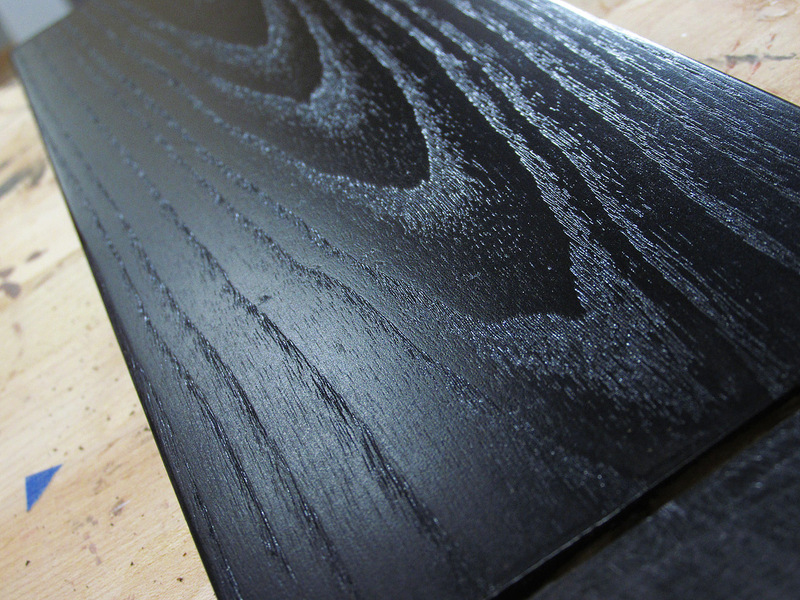 A powerful combo for ebonizing wood: a jet black alcohol based dye gets the surface wood totally black. 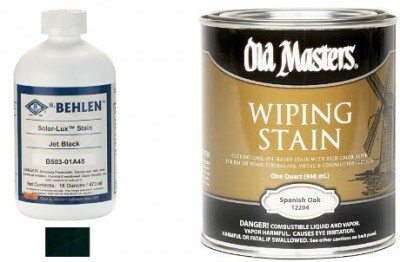 Then the Spanish Oak Wiping Stain by Old Masters makes sure the deep pores get colored black. But there’s a fix, and this is where it’s handy to understand the difference between dye and stain. 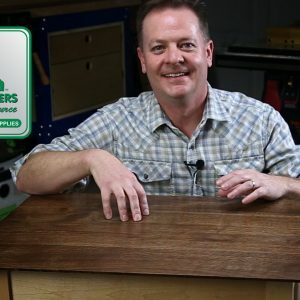 Wood stain’s job is to color wood pores rather than the wood surface. Therefore to ebonize ash is to employ the strengths of both dye and stain. Take a look for yourself, you’ll see how easy, quick, and effective this is. If you use this method, just finish it off with a top coat of your favorite kind of clear finish. That could be polyurethane, lacquer, etc. Ebonizing ash has a cool effect because the texture of the wood grain shows through. You get a 100% black wood without the look plastic – the wood grain shows that you indeed used real wood in your project. With a little side light you really get to see the grain. This may look like white specs, but in fact it’s just the clear lacquer topcoat reflecting light. This is the same board you see on the left.